Researchers have long thought that snail and clam shells found at Caribbean archaeological sites were evidence of ‘ starvation food ’ eaten in times when other resources were lacking. Now, a University of Florida study suggests these shells may be evidence of children helping with the grocery shopping - 400 AD style. What Evidence Revealed Foraging of Ancient Saladoid Children? Researchers found thousands of discarded shells at a site in downtown St. Thomas in the U.S. Virgin Islands , likely evidence of ancient Saladoid children foraging for shellfish. “ Adult foragers typically would discard shells immediately after extracting the meat, meaning few shells made it back to archaeological sites,” said William Keegan, curator of Caribbean archaeology at the Florida Museum of Natural History. This site, however, was littered with them. It's not that people were starving. It's that children were contributing to their own subsistence in a meaningful and very efficient way," Keegan said. "We need to think of children as active members that influence site materials and their distribution. It changes the whole attitude about the collection in the archaeological site." “For the most part, children have remained invisible to archaeologists until now,” Keegan said. This study, the first to document child labor in an archaeological context, provides an important model for identifying children in the past and their contributions to their communities. "Children are really the last group to receive any attention because to archaeology, they sort of look like little adults," he said. "Efforts to identify children so far have emphasized badly made objects, miniatures, and things that look like toys - it isn't a complete perspective." “If your parent needs to go to the grocery store, you have to go with them," Keegan said. "If you can do more than pull candy off the shelf, then you're that much more helpful." Shells deposited in middens - mounds of shells and sediment that were once ancient garbage dumps - led Keegan's research team to believe that shellfish had been intentionally brought to the site, eaten and the shells then thrown away. The team also developed seven criteria to help determine if shellfish at archaeological sites were collected by children. “Shellfish collected by children are most easily identified by variety and size,” Keegan said. Child foragers tend to be generalists, meaning that they're more likely to collect small shells indiscriminately. 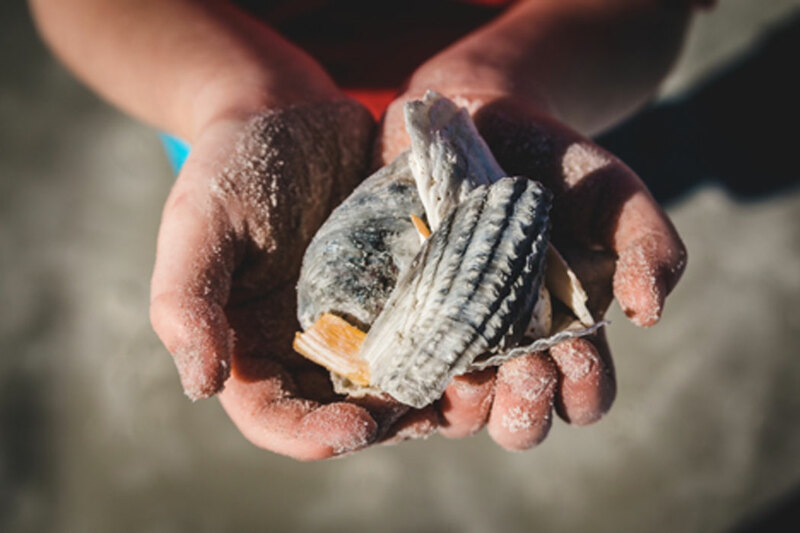 “This research suggests that small, easy to transport, and low-yield mollusks found in high amounts on a site indicate the presence of child foragers,” he said. "It looked like someone had sent a biology student with a one meter square and told them, 'Collect everything’," Keegan said. "You can certainly collect a whole bucket of these things and you've got a good meal, but it's a waste of time for an adult to focus on those really small resources when they could be out collecting specific snails and clams that they know they can get a certain nutritional return on." “Recent construction has disturbed much of the site, and researchers were only able to excavate a snapshot of what was once there,” Keegan said. Because the Caribbean is a largely understudied area in archaeology, Keegan and his team had few ethnographic descriptions of the Saladoid's lifestyles to draw from. They chose to compare their findings with current research in the Pacific Islands, where foraging habits and available resources have remained virtually unchanged for millennia. "It's not a direct application," Keegan said. "It's an analogy that shows what we're seeing in the living population is consistent with what we see in an archaeological population." Evidence suggests that foraging together was a way Saladoid people built kinship, a practice still seen today in the Pacific Islands . The Saladoid people were a matrilocal society , meaning familial lineage was traced through women and men were frequently absent from day-to-day life. "The women would often go on trips with children to collect things farther away," Keegan said. "The community functions holistically. By about age 15, children are involved in fully adult activities." Keegan's work suggests that in some respects, children could actually outperform adults at certain tasks. Whereas adults focused on collecting larger shellfish from deeper waters, children were able to scour shallow areas for smaller shellfish that would be difficult for adult fingers to grasp. "Children like being included. The same sorts of things children need in traditional societies are basically what we still need today to grow up to be healthy, useful adults," Keegan said. "In fact, it wasn't uncommon for children to collect small animals as pets." Because the site is located on St. Thomas' main street, Keegan and his team were able to engage bystanders in their discoveries. "What I think is unusual is that the road caps the site. Below the pipes, everything was completely intact," Keegan said. "The archaeologists were fenced in - all day long people were coming up to the fence and we were showing them what we had, but that's all part of it. We want people to get excited about what we're doing." “Excavation was a collaborative effort that included several experts from different disciplines, lending a broader perspective to the team's findings,” Keegan said. The team was assembled by David Hayes, a founding member of the St. Croix Archaeological Society and project collaborator. "For us, it's always a new puzzle, trying to get the pieces to fit together. One of the real joys of this project was that even though there were specialists for each area, we were all together in the field," Keegan said. "We were all working on the issues together, talking about things and getting a broad picture of what was going on rather than just a narrow focus of one archaeological material." Top image: Ancient Saladoid child foraging for shellfish. Source: cnhay5 / Adobe. The article, originally titled, ‘ Ancient Caribbean children helped with grocery shopping in AD 400 ’ was originally published on Science Daily.